Posted on December 5, 2017 by Skylar N.
I wouldn’t call this the worse book that I have ever read, but It wasn’t my favorite either. I must say it was interesting though. The book starts off with Henry’s mother being “sick.” We are not told the details of the illness at the beginning, we just know that something is not right. The family has just moved into a new house (more details on why later in the book). Her older brother also recently passed. Her father has to leave for business in Italy so he leaves Henry, the housekeeper, Henry’s mother, and Henry’s baby sister Piglet at home. Henry’s mother gets worse and eventually, the local doctor is called out, she is then told to stay in bed all day, have her door locked, and to take a certain pill. She does as the doctor says and only get’s worse. While all of this is going in, Henry feels alone, so she starts to imagine things. One night she sees a light in the woods and goes to investigate, there she finds a “witch”. My main problem with the book was how at the beginning it was very hard to follow and hard to get into. If a child was a reluctant reader, they would not be interested in reading this book. While I won’t go and tell you everything that goes on in the book, I will say that it was very suspenseful and once I got through the beginning I couldn’t put it down. I would say that this is a book an older child would enjoy. A child that loves a good mystery, as to me, that is what this book really is. I thank the publisher for sending me an ARC of this novel, it did not influence my rating of the book whatsoever. 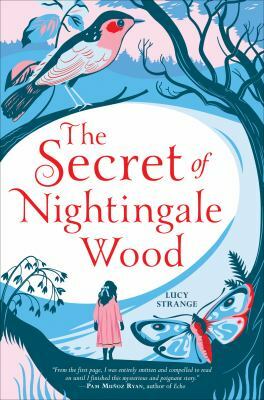 The Secret of Nightingale World by Lucy Strange is available for checkout from the Mission Viejo Library. This entry was posted in Book Reviews and tagged family, fantasy, loneliness, mystery stories, relationships by Skylar N.. Bookmark the permalink.